The fourteenth qualifier of the 2018 Maver Mega Match This qualifier campaign marked another sell out for the competition with one hundred and ten (110) anglers in attendance. Conditions on the day were ideal to begin with with plenty of cloud cover giving a little relief from the intense sun coupled with a decent ripple on the water. The resident carp and bream had long since finished spawning so anglers were optimistic of a good days fishing at the draw. However, as the day progressed, conditions continued to get hotter and hotter burning off the early morning’s cloud cover resulting in a very hot day, which seemed to have an effect on the fishing depending on where anglers had drawn. 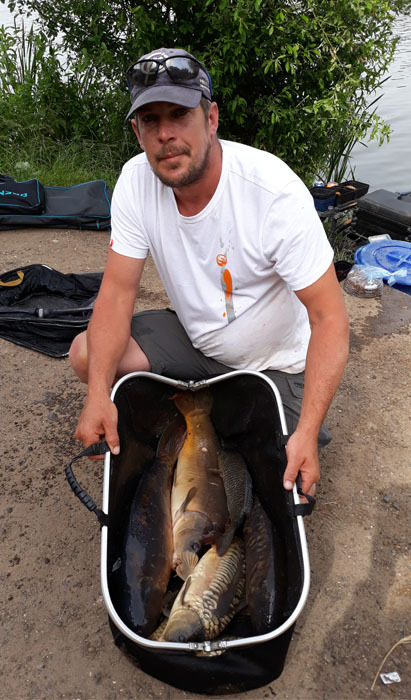 Colin Horwood made the most of a good draw to top a sell out qualifier at Barston Lakes to confirm his first appearance in a Mega Match This final. Winner on the day, and the next angler through to September’s final at Maver Hayfield Lakes, was Colin Horwood (Harefield Tackle). Colin drew fancied peg 124 and fished the majority of the match on the method feeder and ‘tea bag’ at twenty yards to find bream, F1s and carp before moving down his edge late on with pellet to find better quality fish to 12lbs. At the end of the five hours, Colin offered 158-04-00 to the scales to secure overall victory and confirm his debut Mega Match This Grand Final appearance. Colin also earns himself a place in the Maver British Pole Championship final as well. Finishing in second place on the day was Paul Burton (Angler World Holidays). Paul drew neighbouring peg 122 and took a slightly different approach targeting fish in the upper layers on waggler tactics. Paul offered 8mm banded pellet at thirty yards to take carp up to 10lbs to weigh in 104-15-00. Despite missing out on a place in the final, Paul qualifies for this year’s Maver British Pole Championship final. Rounding off the top three on the day was Mosella’s Marc Rodger (Marukyu). Marc drew peg 123 and, like Paul, opted to fish a waggler up in the water with 8mm banded pellet to take carp to 20lbs for a final weight of 95-03-00. Marc also qualifies for the British Pole Championships at Maver Hayfield Lakes on 19th August.